Starbucks utilizes data obtained from the app to better understand customers, their desires, and make better business decisions. Can a member at your credit union expect this same type of digital interaction? These companies understand that they need to digitally transform, constantly, to meet the growing needs of their customers. Therefore, they build significant customer loyalty as a result of using their data to serve customers/members. When prospective members expect this type of high touch digital service for something as simple and trivial as ordering a pizza, will they choose to trust their financial well-being to a credit union that hasn’t digitally transformed? Or will they select a major bank with a flashy mobile app because they are able to comfortably and seamlessly gain information and execute their financial decisions using their preferred channels? Are you there for your members, even when they are not in the branch (and not asking for help)? At a digitally transformed credit union, your data is working for you (and your members) to show trends, preferences, and valuable insights about your members. This allows you to provide the service your members deserve, treating them with personalized and targeted communications and offers to improve their lives and achieve their financial goals, even without asking the credit union for help first. The digitally transformed credit union also utilizes these technologies and creates a data-driven culture. In today’s arena, an organization cannot make business decisions based on “feelings”. Credit unions need to make confident, informed decisions. Data provides answers to the questions financial institutions need to be asking. Digital Transformation is a hot topic because it is a necessary initiative for credit unions. Industry disruption will not stop, and community institutions are not immune if they cannot offer superior service compared to the larger providers. 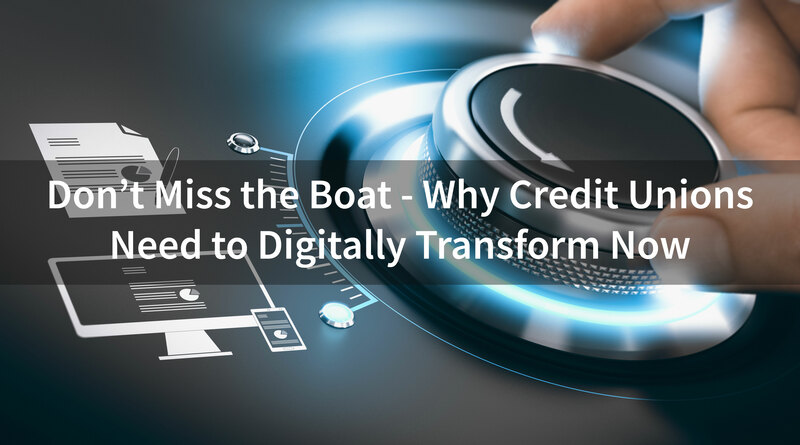 Digital transformation does not come in a box, but is a process and a journey credit unions cannot afford to wait on. At the same time, digital transformation represents incredible opportunities for credit unions. Credit unions, right now, must begin by building and acting on an effective data strategy. As a movement, credit unions can collaborate and grow together through data analytics to provide superior service to members of our communities.